Foreign metallurgists continue to withdraw from the Russian Federation. Following Alcoa’s sale of its plant in Belaya Kalitva, ArcelorMittal owned by Indian billionaire Lakshmi Mittal is getting rid of its Russian assets. It is selling the coal concern Severniy Kuzbas, which it acquired in 2008 for $720 million. 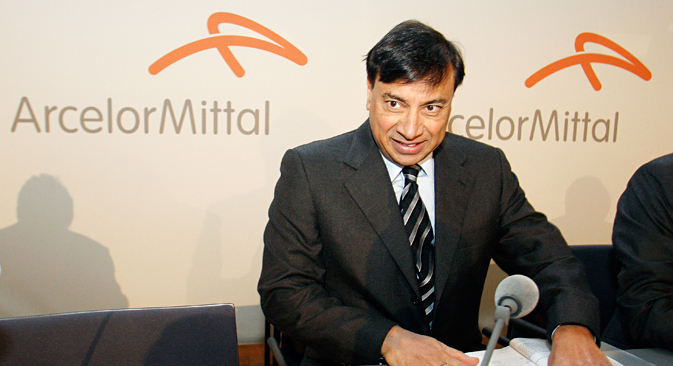 The world’s largest metallurgical company ArcelorMittal owned by Indian billionaire Lakshmi Mittal is withdrawing from coal in the Russian Federation. Severniy Kuzbas coal extraction company is being handed over to Moscow based National Fuel Company Llc, according to a message from the Federal Antimonopoly Service. National Fuel Company has been granted the right by the service to acquire 100% of the shares belonging to Dutch company Kuzbass Holdings B.V., which owns 98.64% of Severniy Kuzbas, and for the management of the Kuzbas group’s assets. The new shareholders of Severniy Kuzbas will make changes to the Board of Directors at an Extraordinary General Meeting on March 30, announced the joint stock company. At the beginning of 2014 the commercial reserves at Severniy Kuzbas’s Berezovskaya and Pervomaiskaya mine shafts comprised 156.5 million tons of coking coal. According to Kommersant Daily, the company’s total reserves, taking into account undeveloped zones, is about 300 million tons of coal. It includes the Severnaya processing plant. The total amount of coal extracted in 2013 was 1.2 million tons with sales revenue of 2.95 million rubles and costs of 1.44 million rubles. ArcelorMittal bought the coal assets in 2008 from Alexei Mordashov’s Severstal for $720 million. Commenting on the deal Lakshmi Mittal said that it will “increase the company’s self-sufficiency in coal from 10% to 15%” and enable us to strengthen our position on the Russian market. But ArcelorMittal did not develop its Kuzbas assets, and extraction was reduced from 3 million tons to nearly one third. As of 30 September 2014 the Severniy Kuzbas assets belonged to Austrian company ArcelorMittal Holdings AG, then Kuzbass Holdings B.V. became the owners. Back in October Lakshmi Mittal told Kommersant Daily at the World Steel conference in Moscow that the company did not intend to sell its coal business in Russia. Last week ArcelorMittal did not respond to a request by Kommersant Daily. National Fuel Company, according to SPARK-Interfax was established only in May 2014, its owner is Elena Myagkova and general director is Valery Nesnov. Both are former top managers from the bankrupt holding company Rostopprom (72.75% belonging to the Federal Property Management Agency, the remainder belonging to Cyprian company Sanoder Alliance Build Limited. In 2010 Rostopprom purchased the Anzherskaya mine from Severniy Kuzbas which already in 2013 it gave to Zarechnaya coal extraction company in return for a 1.5 billion ruble loan. Mr Nesnov gave confirmation to Kommersant Daily that an agreement had been reached with ArcelorMittal, adding that the deal could be closed this week. Severny Kuzbas coal largely went to Ukrainian metal company ArcelorMittal Krivoy Rog. But since 2011 the delivery volume began to decline, a source familiar with the business informed Kommersant Daily. The interviewee who works with a large Kuzbass company said that ArcelorMittal began to seek purchasers for coal assets 1.5 years ago but the “search was intensified following events in Crimea”. According to Kommersant information, National Fuel Company has the partners for the deal with Severniy Kuzbas but market insiders would not name them. It is not the first time foreign companies have rejected metallurgical assets in Russia with the background of the Ukrainian conflict. At the end of November 2014 it became known that a leader in the aluminum industry, the American owned Alcoa company was selling its plant in Rostov Region. According to Sergei Donskoy from Societe Generale, in 2014 extraction from Severniy Kuzbas dropped by 60% only just exceeding 500,000 tons. This indicates industrial problems and that not all of the reserves are suitable for extraction in the current economic climate, consequently Severniy Kuzbas might only be worth “several million dollars”, observed the analyst. But he agrees that what prompted ArcelorMittal to sell may have been a reevaluation of the risks, including those associated with the Ukrainian crisis: the main sales of Severniy Kuzbas are occurring on the Russian market and credit resources are becoming more expensive.